Ready for patio entertaining? We've got it lit up and warm to make that summer feeling never-ending. 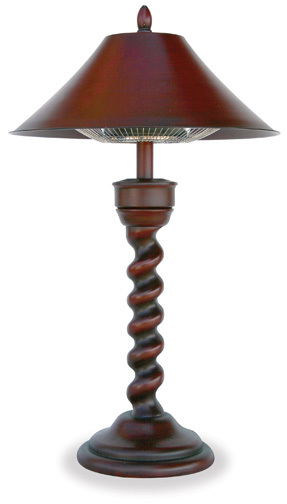 Check out all these fine features of this table lamp/portable patio heater. Energy-efficient heating up to a 12 ft. circle. Weather-resistant hardware with an automatic safety shut-off switch. It plugs into any 120V grounded outlet and has a 8' power cord. No complicated assembly required plus CSA certified with a one-year limited warranty. Nice size at 19.7" L x 19.7" W x 34.7" H.
One of the Best Purchases I've Made! I?m not all that pleased with the height of this product. It?s entirely too tall to use on a table, but it?s too short to use on the floor. I do like the way it looks though, and I?m getting used to the awkward height. It arrived in excellent condition, and after a few months of use, I can use it without any issues whatsoever. I love the light it provides, and the heat is perfect if you are sitting very close by. This lamp functions exactly as it was described, and since we live in Santa Fe, New Mexico, will we get to use our outdoor dining area for a longer period of time with this lamp. I would like to add, though, just like other reviewers have said, our lamp, too, was delivered cracked. I was able to repair the lamp with some super glue, but I?m not sure how much of a permanent fix that will be. Also note that lots of patio tables come with holes in the center that are designed to hold an umbrella?s shaft. So it should, in theory, be pretty easy to run the lamp?s cord through that hole, but I actually had to end up cutting part of the base to get the cord free to be dropped down through the hole. All in all, I do like this lamp, especially the lovely warm glow of its light. Our new heater works perfectly for those cool nights when you want to spend time outdoors. It heats up a decent sized space, and if you sit nearby the heater, you will be warm and comfy! This lamp has made a wonderful addition to my screened in porch. It?s very pretty, and gives off a surprisingly nice amount of heat. I would definitely recommend! My new lamp was easy and simple to assemble, and it looks absolutely fantastic! It gives off a nice amount of warmth, and will be amazing in the late fall and early spring! This lamp should come in very handy for the cooler mornings and evenings here in Arizona. It looks amazing and blends well with my outdoor d?cor. This heater is amazing!! We use ours almost every day in the winter under our canopy. It keeps up nice and warm. I would have given it five stars, but the instructions were impossible to follow. It was hard to assemble, and the instructions actually made the process more difficult. I think you?re probably better not even reading them at all, and just figuring it out with common sense. Now that we have it assembled though, we have really enjoyed it very much. I purchased two of these heaters. One for my backyard patio, and one for my smaller deck that sits right off of my kitchen. I really love hanging out outdoors reading or talking with friends, and now I can continue these activities even when it gets a little chilly outside. I would definitely purchase another! I recently purchased this heater for my porch, and it is absolutely perfect. All of my buddies wanted to get one, so everyone ended up with one for Christmas gifts. This heater was delivered quickly, and was easy to put together. This product really does extend the amount of time you can spend outside. The one flaw of this piece is that the finish has begun to chip off after being exposed to the weather outside. I?m still happy with it though. Easier to Use than Gas Heaters! I purchased this heater several years ago, and it?s still working very well. It is now a little dented due to being knocked over by the wind, but the heater still works fantastically. I recently purchased a second heater to use on our patio bar. If you have a patio table that is round in shape, this heater will work well, as you can put the cord through the hole in your table. I agree with other reviewers that have stated that this heater doesn?t get quite as hot as a gas heater does, but it does make those cool nights a lot more comfortable.